The WTS Colorado student chapter invites you to a fun Earth Day service activity - the South Platte River Clean Up! 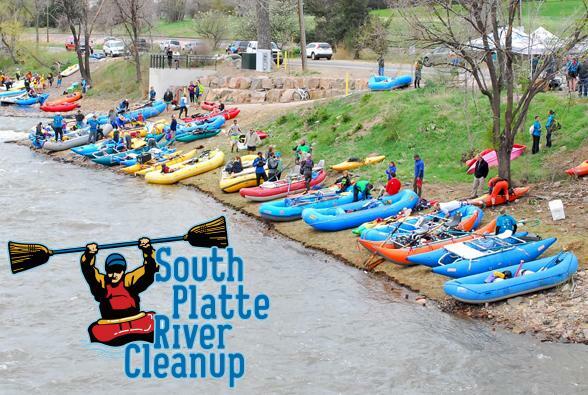 In past years, over 250 rafters, kayakers, cyclists and pedestrians have come together to successfully remove over 2 TONS of garbage from Denver's South Platte River corridor! Please join us for this unique, fun and relaxed networking opportunity and give back to your community! The WTS Colorado student chapter invites you to a fun Earth Day service activity - the South Platte River Clean Up! In past years, over 250 rafters, kayakers, cyclists and pedestrians have come together to successfully remove over 2 TONS of garbage from Denver's South Platte River corridor! Please join us for this unique, fun and relaxed networking opportunity while giving back to your community! Registration & Shuttles: 9-10:30 a.m.
On the Water: 11 a.m.-2 p.m.
S.W. Corner of Florida Ave. & S. Platte River Dr. Registration is FREE and includes an after party with giveaways at Confluence Kayaks! Register the day of the event at the put-in location to sign the waiver and grab your t-shirt! For more information, please contact Meredith Suelau, Jessica Stemley or Stephanie Leonard.